(1) The sirloin strip cut into 5 cm into the soup pot boil hot for 5 seconds, picked up the wash stand. (2) white radish, red radish, peeled, washed and cut back. Wash and cut diagonal slices ginger, onion, garlic, red pepper wash stand. (3) heating the salad oil into the wok, add the processing good material a, b, c saute. (4) into the sirloin stir-fry until half cooked, then add soy sauce and stir. (5) then add 6 cups of water and bags, sugar, onions boiled five minutes together. (6) then add red, white radish blocks to simmer over medium heat for about 35 minutes until the meat Shulan. Many people are fond of eating potatoes, potatoes fact itself is rich in nutrients, for people who love to eat potatoes, how do love to eat potatoes. This potato meat, meat and vegetables, nutritional balance, do not look at is a home cooking, the taste is very delicious oh. After soaking in water, peeled potatoes in a moment, remove excess starch, potato black can be prevented. Hot summer weather, always no appetite, but now in the winter, the weather is cool, we must eat meat, do not eat all of the summer to make it up, the best is pork, and made Pork, Ruannuo delicious aroma. 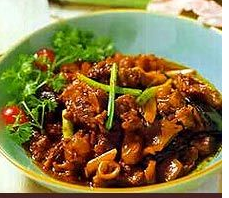 Away from home for several months, good greedy mother’s twice-cooked pork, oh, spicy and delicious not to say that the key is fat but not greasy meat, eat meat when eating a plate of cooked pork, will be particularly satisfied, very satiety. This Road homemade twice-cooked pork, fragrant. Ingredients: 250 g pork, tofu 1 bag (200 g), green peppers, red peppers number only, ginger, garlic, onion amount. Spices: pepper 1 small handful, bean paste 2 tablespoons (30ML), sweet bean paste 1 tablespoon (15ML), a little soy sauce. 1, under the pot boil ginger, garlic, peppercorns, onion and water together, add the pork, cover with medium heat and simmer for 8-10 minutes. 2, remove pork, rinse with cold water, cut into thin slices. Tofu, green peppers into strips and set aside. 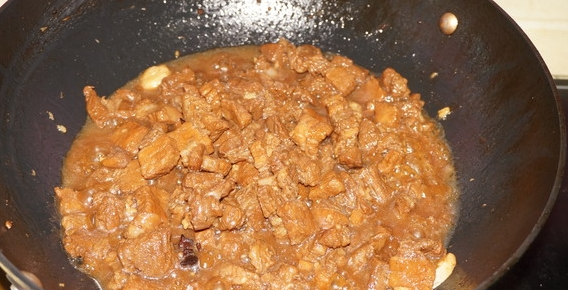 3, ginger garlic saute pan, add the pork slices, saute, stir-fry until golden on both sides of the pork. 4, under the sweet sauce and bean paste, flavor Stir and let the pork absorb the sauce flavor, fried under Dougan silk mix, and finally under green peppers silk, under a little sugar and soy sauce, fried green peppers silk off the fire dish edible. 1. Choose to do twice-cooked pork fat and lean pork is appropriate! 2. Cook the pork under the ginger, garlic, onion and pepper can get rid of the meat smell of urine, so that more pork meat flavor. 3. The time to cook pork over medium heat 8, 10 minutes, do not cook too long! Pork ribs are delicious really is how to do, even if you are a kitchen novice, the first production, tastes good, oh, this road garlic spare ribs, crispy and delicious, fragrant, delicious mellow. Pork ribs with nourishing yin, Yijing blood effects; suitable for lack of blood, Yin anorexia. Beef delicious, nutritious, is many people’s favorite, but a small piece of beef, the price is high, heart dish of beef, cabbage absorb the scent of beef, tastes more delicious. Carrots are high nutritional value of food, but if improper cooking or mismatches, which can affect the absorption of nutrients. Carrots contain a lot of carotene. Carotenoids are fat-soluble substance, only to dissolve in fats, can be transformed into vitamin A is absorbed in the small intestine mucosa role of the human body. So, when do the carrot dish, the extra oil, together with the best fried meat. Also, do not eat raw carrots, raw carrots are not digestible and absorbed, 90% carotene is absorbed by the body because they do not directly excreted. Cooked carrots shorter time to reduce the loss of vitamin C. As long as a reasonable cooking and with the right mix, carrots are a good source of vitamin A. Carrot is now recognized worldwide as nutritional share. January 1, 1991 the European Economic Community made a resolution, the carrot as a fruit. In accordance with this resolution, when making candied carrots, carrots are called fruit. Admittedly, carrots with high health effects and medical value, but experts have warned that the US Food: “carrot drinks” way of eating is unhealthy. Because carrots are rich in carotene and alcohol enter the body, they produce toxins in the liver, causing liver disease. Where people want to change the “carrot drinks,” the traditional way of eating, carrots should not do tapas, drinking and do not take carotene nutrients, especially after drinking carrot juice not to drink immediately, so as not to endanger health. Carrots, scrambled eggs can reduce the incidence of ovarian cancer. Eggs are rich in minerals the body needs protein, fat, vitamins and iron, calcium, potassium, protein is nature’s best protein on the liver tissue injury repair; also rich in DHA and lecithin, egg yolk on the nervous system and physical development can be beneficial, brain puzzle, improve memory, and promote regeneration; eggs contain more vitamin B and other trace elements, can be broken down and oxidized in the human body carcinogen, has anti-cancer effect; eggs sweet natured; with uneasiness of mind, blood, yin and moistening effect. Carrots can provide a wealth of dimension A, can promote the body’s normal growth and reproduction, maintenance of epithelial tissue, prevent respiratory infections and maintain normal vision, night blindness and dry eye disorders treatment function. While enhancing the role of the human immune system and cancer, and reduce the response to chemotherapy in cancer patients, has a protective effect on various organs. Eggs and carrots can give the body to provide rich nutrients, studies have also said that women eating carrots can reduce the incidence of ovarian cancer. Practice: shredded carrots, green onions and cut green onion. Eggs, add a little salt, beating well. Pot of oil, a little more, add carrots and gently stir-fry, this time the pot of oil will become carrot color. The carrot Sheng, Sheng out half the oil and half left in the pot, add the eggs. Eggs began to take shape immediately placed carrots, stir-fry, sprinkle chopped green onion. The remaining half of the carrot oil into the can. Practice: the carrot and red dates cook, eat cooked carrots, dates and soup can cure whooping cough. With carrots, rice, half a catty, add carrots and boiled into porridge for children with measles have a good effect because of a lack of vitamin A cause of “dry eye” and so on.